Before our Lord was crucified, he was tried by a Jewish religious court, who then bounced him to a Roman civil court headed by Pontius Pilate. 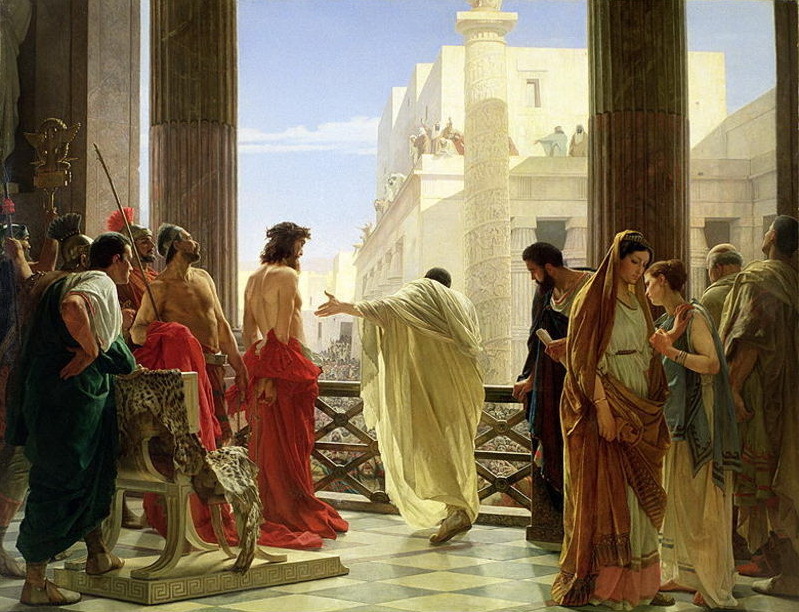 Pilate initially declared Jesus innocent, but caved to pressure and agreed to execute him. Between the sentence and its execution, the Roman guards mocked Jesus, dressing him up and acclaiming him as the King of the Jews. However, the two accounts in the Bible initially seem to be at variance. Strong's Concordance records that the words "scarlet" and "purple" are correctly translated from the Greek, and both words for these colors appear elsewhere in the New Testament. What then are we to make of this? But a purplish shade was not confined to purpose-made purple colors. "Cicero made a derogatory comment that wool taken from sheep reared in Canusium--which was brown with a reddish hue--acted as the poor man's purple." (Graham Sumner, Roman Military Clothing, pg. 115) With this background of Roman culture, this supposed Biblical contradiction vanishes. The robe the soldiers clothed Jesus in was a shade of red used as a purple. Perhaps it had originally been dyed with blue, or perhaps it was the "poor man's purple." But the most important point to remember about the crucifixion is that none of these events were unexpected for Our Lord. He stated: "No man taketh it [my life] from me, but I lay it down of myself. I have power to lay it down, and I have power to take it again." (John 10:18) Jesus knew everything that would happen to him, and he accomplished it because of his love for the world. Because of His sacrifice, he invites us all to know Him. Great explanation! I had assumed scarlet and purple were two words for the same color, but this makes more sense.